Kenneth Grace and Niño met during an inter-church youth camp in Calaca, Batangas. They have the same burning faith in God, which made them click easily. One thing led to another and the next thing they knew, they were ready to spend the rest of their lives together. According to Niño, he always prayed for a partner like Kenneth Grace—someone with the same faith as he did. Why? Because it would bind them together despite their differences. Kenneth had a similar belief. For her, an ideal partner was whoever Jesus wanted for her. And yes, they both found what they were looking for the moment they met. Niño proposed to Kenneth Grace on February 23, 2015. After the proposal came the preparations. The bride was keen to details. She wanted things to be well thought of; she did not hurry to make decisions. Instead, she was the type of person who would present all the details to the groom and let him choose and rethink the decision to be sure. No wonder, they were able to pull off a really lovely wedding last March 18, 2016 at Los Arcos de Hermano in San Jose Del Monte Bulacan. It was a romantic classic wedding. It also gave everyone a heavenly feeling for it spoke of who they were not only as persons but as Christians. It was also a testimony of where Christ’s love has brought them. 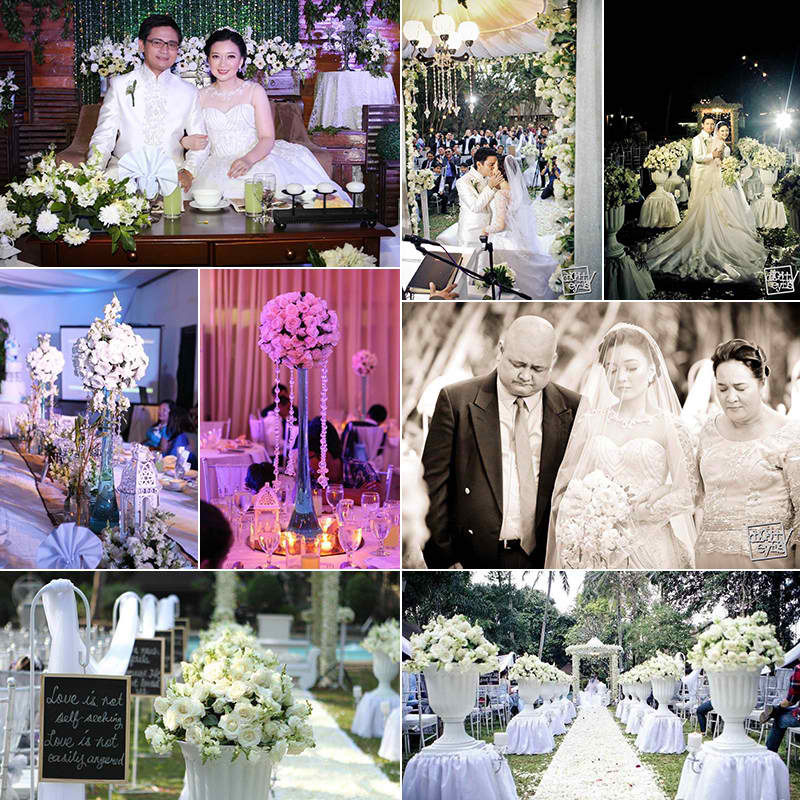 To convey all these, the wedding had an all-white decoration. Apart from having gorgeous floral decorations, they also had love verses from 1 Corinthians on the aisle because those words helped Kenneth Grace realized that Niño was the one. The reception was very simple yet elegant. Guests enjoyed the food, program, souvenirs, as well as the photo booth. Of course, the success of this wedding was all thanks to their chosen wedding suppliers, including Tito Renz (catering), Los Arcos De Hermano Resort (venue), Digit.eyes (photography and photo booth), Grynne Bejarin (bridal hair and makeup), Rizza Aganap (entourage hair and makeup), Honeyglazed Wedding Cakes (cake), David Mercado (host), Ronald Labor (wedding rings), and Richard (florist). And of course, the bride loved her wedding dress created by Amour Couture by Cheena Ng Lio. Kenneth Grace loved the fact that Amour Couture was able to accept all of her special requests. The wedding dress maker was also very easy to work with. Amour Couture also took care of the groom’s attire and accessories. They are also ever grateful of their church that helped them with everything, especially Ptr. Tim Ogatis and family. In the end, the couple was so happy and proud because they worked so hard to have such a wonderful wedding and everybody loved it down to the littlest of details. Indeed, it was a dream come true for both of them. They were glad, too, that they were able to share that lovely moment with the ones closest to their hearts.